This Lebanese breakfast is a bean and bread feast that works anytime of the day. Sometimes a simple menu is a good menu. 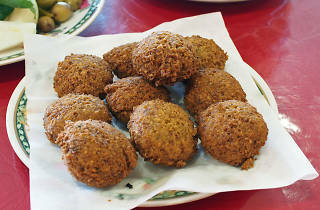 At Hammoud 1 the main options are straightforward: falafel, foule, houmos and fateh. The entire menu is stretched to about eight different dishes, with or without meat options. And while the crunch of deep fried falafel and the smooth creaminess of houmos are common fare around kebab bars and Middle Eastern restaurants, they’re not the traditional dishes that makes this small, plastic tablecloth-topped restaurant a go-to for the Lebanese community in Liverpool. 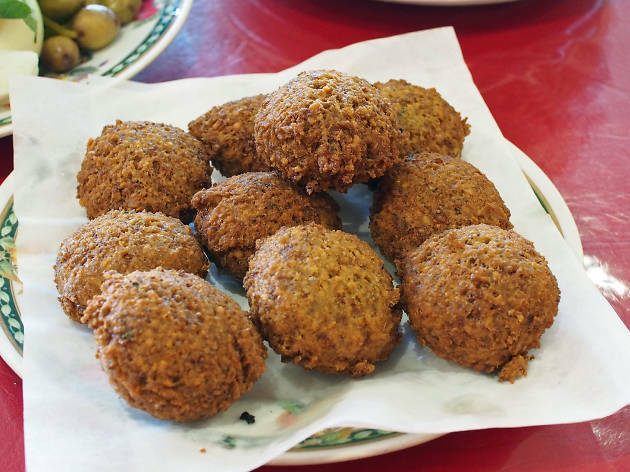 Located along the busy Macquarie St eat street (Jasmin 1 and Al Barakeh Chicken are within falafel-throwing distance) prepare to rub shoulders with tables of large families with of food covering every available space. Breakfast usually starts with a bowl of foule. Fava beans and chickpeas are slow cooked until soft and creamy, then roughly mashed with garlic and lemon juice. Tahini, a sesame seed paste that adds a roasted nuttiness to the finished bean dish can be added for extra flavour. Topped with fragrant olive oil and fresh mint leaves, the result is a thick porridge of a bean dip you spoon up with torn pieces of warm pita bread. Fateh is considered just as essential to a Lebanese breakfast, made with the same chickpea base as houmus but with the addition of yogurt and pine nuts, giving the legumes more creaminess and a nuttier flavour. Small pieces of broken pita bread are piled into the bottom of the serving bowl to soak up the sauce, and the smooth fateh is topped with fried minced lamb seasoned with garlic, cumin, cinnamon and paprika and sprinkled with crisp almond slivers. The result is a spiced warmth and a comfort factor that’s off the charts. A complimentary plate of fresh mint leaves, pale green olives, wedges of raw white onion, long pickled green chillis, turnips and cucumbers and bright red slices of tomato let you jazz up your meal. Pull apart a slice of soft pita bread into small pieces, scoop up some of the foule with it and top with mint and pickle, or use the pieces of onion as an impromptu spoon to go from dip to mouth. The takeaway deals are a huge draw and keep this place extra busy. We think the falafel roll special is one of Sydney’s biggest lunchtime bargains at $3.50 each or three for $10. If you’ve got the stomach room, (the serves here are generous) don’t forget to order extra falafel to take home as well: 16 pieces will leave you with change from a tenner.